I was young here, pretty young. This was in the backyard of our place on East 45th St. It wasn't much of a backyard, but to us it was a fine location to play in, particularly in the summer after a heavy New York City rain when we could funnel water into little canals in the dirt. There was entry to the "cellar" nearby, and the garage shows in the background -- both places were frightening to me, and seldom willingly entered. 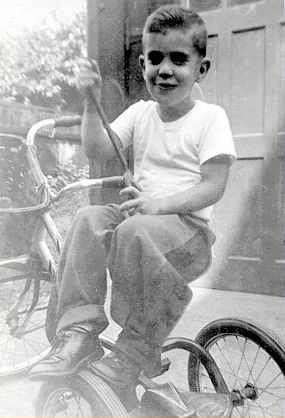 I moved up from the tricycle to the "two-wheeler" at a fairly early age, as I recall. After a few brief trials I was ready for the real thing -- I would have little to do with the training-wheels that my parents expected me to use. 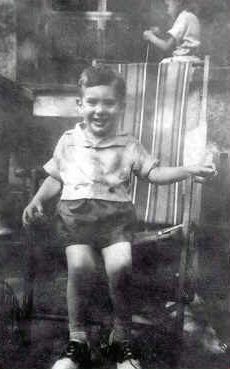 And this was me by our "stoop" in the front of the the house.... Slightly later in life, perhaps?